The Chincoteague Seafood Festival will be held on Chincoteague Island, Virginia's only resort island, at Tom's Cove Park. Handicap parking and courtesy shuttle are available at the festival grounds. Limited parking is available at the campground, so we encourage attendees to ride the Pony Express trolley. The trolley will run the GREEN ROUTE on festival day which stops near most motels and campgrounds for your convenience at approximate 30 minute intervals. 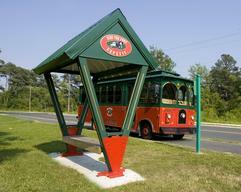 The trolley will also stop at the Chincoteague Combined School, 4586 Main Street, for day trippers. Once parked at the school, call 757-854-8572 and the dispatcher will send the trolley your way! The trolley is handicap accessible. PONY EXPRESS TROLLEY SERVICE IS OFFERED FREE OF CHARGE TO OUR FESTIVAL ATTENDEES FROM 9AM TO 5PM! After 5pm the charge is $0.25/person and pick up will be at the trolley hut at the entrance of Tom's Cove Park on Ridge Road. 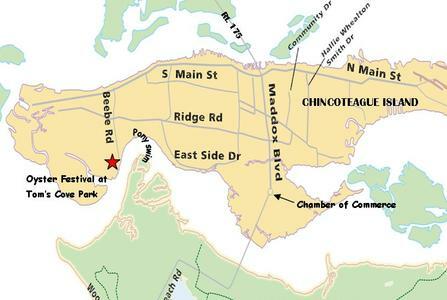 Use 8128 Beebe Road Chincoteague Island, VA 23336 for GPS settings or to get directions from MapQuest or other online map sites. 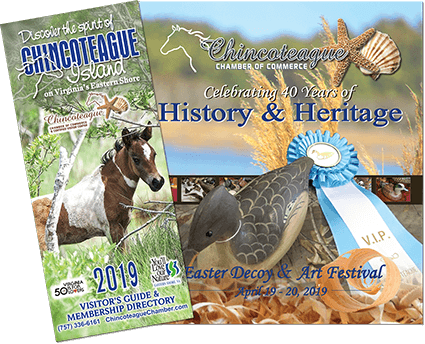 Visit www.chincoteaguechamber.com for lodging and other activities happening festival weekend. Click here to request a travel guide.